You are here: Home / Blog / Featured / When Did Science Begin? I keep reading and hearing people talk about science as if it all began with the Western model of rational thought in the 18th and 19th centuries when reductionistic science replaced what was then considered false beliefs or witch doctor hokey pokey. The materialistic values of Europe overran generations of less-materialistic practices making them seem archaic and outmoded. It seems ironic that after centuries of invalidating shamanic practices, labeling them barbaric and even silly, we are now starting to discover the wisdom in many of those practices and learning from them. So who is to say these indigenous cultures didn’t have a science just because they didn’t possess laboratories and the industrial tools employed by more modern scientific researchers and practitioners? Why couldn’t it simply be science of a different order – based on dreams, intuition, lessons from Nature and her plants – not test tubes, X-Rays and surgeries. Wikipedia defines science (from the Latin word scientia, meaning “knowledge”) as “a systematic enterprise that builds and organizes knowledge in the form of testable explanations and predictions about the universe.” Might not this include shamanistic practices passed from generation to generation by word of mouth, not by text books? On the other hand, “modern science” is most likely what most people mean when they talk about science. Galileo (pictured at right) is considered the father of modern science but not the father of science. No one can lay claim to that title because science has been around since humankind started gaining knowledge about the working of natural things. This was long before recorded history. I propose that science was being practiced by human beings long before there was the written word. After all, we learned to talk and share knowledge before anyone got the idea of writing. The earliest roots of science can be traced to Ancient Egypt and Mesopotamia around 3500 to 3000 BCE, but these roots can only be traced because of physical evidence, whether hieroglyphics or cave art. Oral traditions served as the original schools of science. 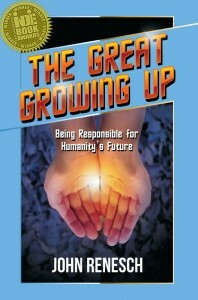 On May 19, 2013 at The Harvard Club in New York City an award was presented to The Great Growing Up: Being Responsible for Humanity’s Future by Next Generation Indie Books Awards who named the book the 2013 Grand Prize Winner for Non-Fiction. 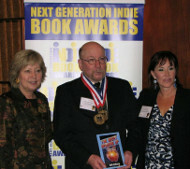 The Award was presented to San Francisco futurist and author, John Renesch, at a gala awards ceremony. Twenty five judges selected the winning book from sixty different categories.